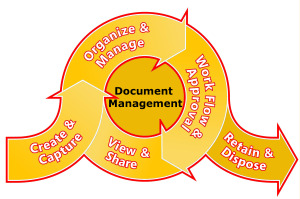 Document management is the business practice that controls the life cycle of critical business documents. These documents may come in the form of purchase orders, invoices, contracts, receipts, financial statements, etc. The life cycle refers to all the aspects of how these documents were created, managed, shared, retain and dispose. According to AIIM, organizations that lack of document management strategy is leaving money on the table. For example, if a document cost $20 to file, the company may spend another $120 if the document is misfiled, and an additional $220 to reproduce it. Professionals spend between 5% to 15% of their time reading information, but up to 50% of their time looking for it. Document management does not have to be complicated. The secret to a successful implementation is to keep it simple, seamless and fully integrated with other internal business processes. How can document management help me? When your company is bogged down by paper forms, binders, file rooms, and multiple digital folders you will reach a point of diminishing returns. The more processes you add, the less efficient you become. You start to feel the pressure of not being able to respond quickly to your clients because your information can’t be found efficiently. Your inbox becomes your source of truth for every important document you have. Increase productivity by reducing chaos when searching for documents. Reduce risk of information leaks by securely storing documents. Increase ROI when using workflow, and collaboration for creating documents. By enabling the correct document management strategy, you may restore confidence in your information. The ability to access documents from anywhere and at any time will give you the flexibility to adapt and proactively be on top of your business. Your staff may focus on growing your services rather than chasing documents. With the addition of AI technologies, your documents may contain key information patterns that you can analyze to improve your services. Where do you start? Can you implement it in phases? Should you go Cloud? How can you integrate with your internal systems? These are the questions that Eureka iTech can help answering. We have many years of experience building solutions for many small and large clients. Contact us and sign up for our Value Discovery Workshop to see how your company can start using document management strategies. Contact us today for free consultation. Eureka iTech staff has experience implementing and supporting many electronic document systems. We’ve helped companies replace paper based processes with electronic workflows that improve process visibility, provide real-time status, and eliminate delays. One project transitioned a department’s paper-based invoice system to a fully automated workflow process based on IBM FileNet P8 that dramatically reduced the invoice approval time from 20 days to 5 days. We have experience working with several document management systems including FileNet, Lotus Notes DomDoc, SharePoint, Kofax, and others. Whether you are looking to integrate or consolidate, give us a call. We can help.